The UK’s first floating solar farm has been unveiled in Berkshire; the array features 800 photovoltaic panels and has a capacity of 200W. The project cost £250,000 ($405,400) and has been installed on a reservoir at Sheeplands Farm near Wargrave. Solar energy provides many advantages, but also raises many problems. Among those problems is land area – whenever you use an area for solar energy, you’re taking that area from some other potential use (usually agriculture). Floating solar arrays have been given growing attention as they could provide energy without taking away precious agricultural land. You can build an array on lakes, dams, irrigation channels and even remediation ponds; basically, any water stable water mass. These arrays also have another advantage – they create shade, which prevents water evaporation. 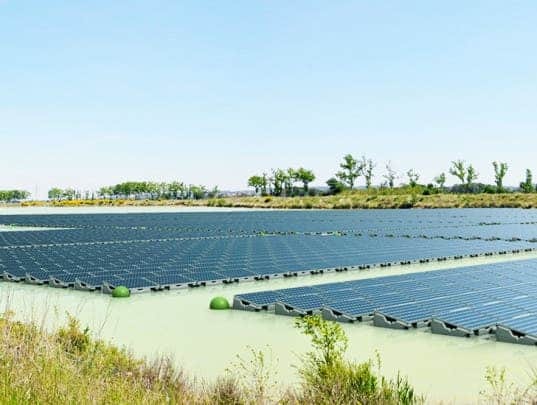 Similar systems have been trialed in France and India, and Japan intends to install the world’s largest floating solar array (with a massive 1.7MW output) near Osaka. But this is the first one in the UK, so it has its own significance. The array is able to provide a return on investment in six years. In other words, if everything works out fine, the investment will be covered in six years – and everything that comes after that is profit. Every year, the array will earn around £20,500 ($32,000) a year for the next 20 years from consumer-funded subsidies for the power generated. Floating Solar UK will further promote and distribute the technology in the UK. There are plans to further develop this technology in the US.